A native of Belleville, Sanok worked as a caddie at Forest Hill Field Club in the 1930s and finished runner-up in the 1938 State Junior Championship at Echo Lake. Winning five State Amateurs, Sanok also won the State Open in 1951 and 1956. In 1952, he became the first amateur to win the Met Open. While most of his success came in the 1950s (playing out of Upper Montclair Country Club), he remained a threat on any golf course well into the 1970s. 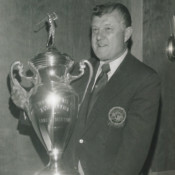 In 1974, he became the only man to win both the State Amateur and the State Senior Open in the same year. In 1975, he won both the Ike and his final State Amateur. Sanok defeated Ben Hogan in an exhibition match at Forsgate in 1953, the same year Hogan won the Masters, the U.S. Open and the British Open. Sanok defeated him by two strokes. The NJSGA Hall of Fame has been established to recognize and enshrine men and women who, as New Jersey natives or residents at their time of achievement, have impacted New Jersey golf and/or have made extraordinary contributions to the game through competitive and non-competitive accomplishments. The mission is to honor New Jersey’s finest amateur and professional golf competitors, as well as those who have made outstanding contributions in other areas of golf such as architects, journalists, superintendents, mentors, volunteers and others.